Guangdong is a province on the Sooth Cheenae Sea coast o the Fowkrepublic o Cheenae. The province wis previously aften written wi the alternative Inglis name Kwangtung. It surpassed Henan an Sichuan tae acome the maist populous province in Cheenae in Januar 2005, registerin 79 million permanent residents an 31 million migrants who livit in the province for at least sax months o the year. The provincial caipital Guangzhou an economic hub Shenzhen are amangst the maist populous an important ceeties in Cheenae. Syne 1989 Guangdong haes toppit the tot GDP rankins amang aw provincial-level diveesions, wi Jiangsu an Shandong seicont an third in rank. Accordin tae provincial annual preliminary statistics, Guangdong's GDP in 2010 reached CNY 4,550 billion, or USD 689.02 billion, makkin its economy roughly the same size as that o Turkey or Indonesie. Guangdong haes the fowert heichest GDP per caipita amang aw provinces o mainland Cheenae, efter Jiangsu, Zhejiang an Liaoning. The province contributes approximately 12% o the PRC's naitional economic ootput, an is hame tae the production facilities an offices o a wide-rangin set o multinaitional an Cheenese corporations. Guangdong hosts the lairgest Import an Export Fair in Cheenae an aw cried the Canton Fair in Guangdong's caipital ceety Guangzhou. "Guang" itsel means "expanse" or "vast", an haes been associatit wi the region syne the creation o Guang Prefectur in AD 226. "Guangdong" an neebourin Guangxi literally mean "expanse east" an "expanse wast". Thegither, Guangdong an Guangxi are cried the "Dual-Guangs" (兩廣 liăng guăng). Durin the Sang dynasty, the twa Guangs wur formally separatit as Guangnan Dong lu (廣南東路) an Guangnan Xi lu (廣南西路), which became abbreviatit as Guangdong lu (廣東路) an Guangxi lu (廣西路). The modren abbreviation 粤/粵 (Yue) is a shortened form o Baiyue (百越), a collective name for various fowks that livit in soothren Cheenae in auncient times. 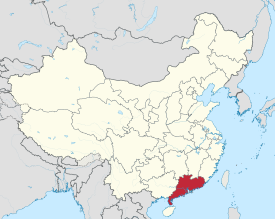 Prior tae the introduction o Hanyu Pinyin, the province wis kent as Kwangtung Province. Ane shoud note that Canton, tho etymologically derivit frae a Portuguese transliteration o "Guangdong", refers anerlie tae the provincial caipital insteid o the whole province, as documentit bi authoritative Inglis dictionaries. The local fowk o the ceety o Guangzhou (Canton) an thair leid are still commonly referred tae as Cantonese in Inglis. Acause o the prestige o Canton an its accent, Cantonese sensu lato can be uised for the phylogenetically relatit residents an Cheenese dialects ootside the provincial caipital an aw. The abuin diveesion govren, in tot, 49 destricts, 30 coonty-level ceeties, 42 coonties, an three autonomous coonties. For coonty-level diveesions, see the leet o admeenistrative diveesions o Guangdong. ↑ "China's Provincial GDP Figures in 2011 | China Briefing News". China-briefing.com. 27 January 2012. Retrieved 25 April 2012. ↑ "Chinadaily.com". Chinadaily.com. Retrieved 25 April 2012. ↑ "preliminary statistics of Guangdong'GDP in 2009". 210.76.64.38. Retrieved 25 April 2012. ↑ "GDP of 31 provinces in China released". English.peopledaily.com.cn. 26 February 2010. Retrieved 25 April 2012. Wikimedia Commons haes media relatit tae Guangdong.